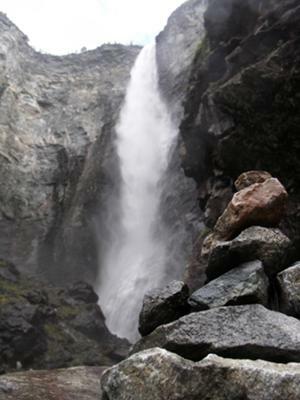 Have been admiring your site and the huge amount of waterfalls you and your wife have managed to tick off around the globe – very impressive, well done guys. My wife (Karen) and I enjoy getting our feet wet too and enjoyed many happy times in Yosemite a couple of years back. 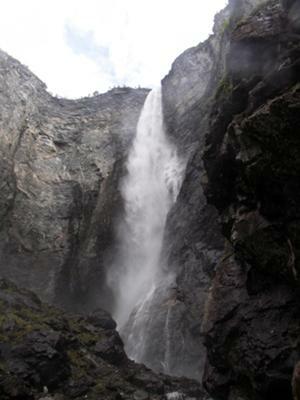 Last year we honeymooned in Norway and headed down the Utladalen while we were there to see the towering Vettisfossen. You’re right about the protruding rock that obscures the best views but having trekked there we thought we might try and get a little closer. I’ve uploaded a couple of pics to show how the base looked around the corner of the rock and also the small cairn of rocks that a few hardy souls had started to build once you’ve braved the water gushing around your feet. The rocks underfoot were pretty slippery but the thrill of getting to see the mist break was enough to keep us from slipping in! Hope you like the shots and keep up the great work on the site.